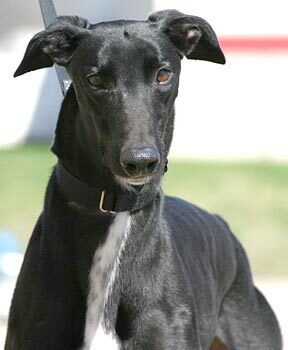 Dale, aka Cry Dale, is a handsome, 3-year-old black male born December 28, 2004. 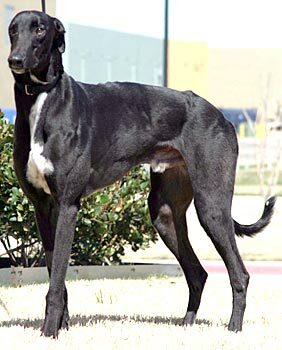 His sire is the late famous Gable Dodge, making his grand sire Wigwam Wag, and his dam is the Irish bred Clare Fairy. Dale's racing career consisted of 85 races starting August 4, 2006, at Gulf Greyhound Park in La Marque, TX, and ending December 29, 2007, at Corpus Christi, TX. Dale was a steady consistent contender, but his main focus now is finding his forever home. Dale’s cat test: Dale saw the cat and his ears went up and he was pretty interested until Molly hissed and gave him a few swats across the muzzle. He turned away, then back toward her, she hissed, he turned away and started to turn back, then thought better of it. We tried to get him to go back by her, but he refused. We then brought out the big mellow cat and Dale was not too interested in going by her either. We convinced him to take a sniff, he did, and then moved onto investigating other things in the house. Dale should be cat trainable, as always using caution and a muzzle while training. Dale is one big bundle of love. This big ebony boy walks with such confidence that you instantly feel secure walking by his side. He greets you every morning with a gentle nudge and kiss as he reaches his face over to yours to gently wake you. From the time he wakes up, he is one happy boy, full of joy and happiness. His favorite thing in the whole world is FOOD! I would imagine he would be very trainable with obedience classes as he is so food driven. He is quiet, not a barker, but when he does bark it is high pitched - something you would expect from a smaller guy. This brings us much laughter. He will talk if you roo to him and this really is so cute. Because Dale is such a big boy he will need a little space in his new home. He would do well with a female dog because he loves the girls and the girls love him, probably due to his confident nature. He accepts our male greyhounds and they accept him, but he really prefers to play with our female greys. He's quiet at night once he's had dinner, and is happy lounging around with his family. He is extremely people oriented and bonds quickly, especially with females. I might even go as far to say he is a momma's boy because he follows me around and wants to be with me wherever I am in the house. He will do best in a family with only adults or older children as he is still a puppy and learning to curb his nibbling when playful. He is independent, so he should do well as an only dog, as long as he's able to spend quality time with his owner. He crates well and will need an extra large crate to rest comfortably during the day while his owner is working. Dale walks well on a leash, and as long as you keep him close to your side while walking he will not pull. He understands that by doing this, you are the pack leader and he respects this. He will need an owner who is willing to be the pack leader because he will need this type of discipline to make him a really great companion for you and your family. He has been cat tested and would do best in a cat household where the cats are confident and teach him to respect them. A few swats from the cat should do the trick to start this off right. A less confident cat may be too afraid of him due to his size. Did I mention he loves food? He's a lover of fruit and will eat most any fruit you offer him such as bananas and apples – please don't feed grapes or raisins as these are toxic to dogs, but anything else should be fine. He also loves veggies and is especially fond of cucumber. He eats about 4 cups of high quality kibble per day and usually gets vanilla yogurt added several times a week as a treat. He so loves this. Dale is extremely sweet and loving and a wonderful companion. I find him to be a very special boy and his Irish heritage makes him even more handsome and irresistible. Come and meet Dale and you will see why he is so easy to fall in love with.